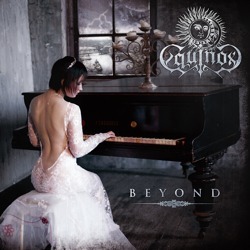 Russian dark folk metallers Equinox from Moscow have just released their debut EP “Beyond“. After the termination of Beer Bear project, in the summer of 2013, Kirill Nikeev decided to form a new band with a more serious approach. On February 10th 2014 Equinox released this digital EP (you can download it in their official profiles below), offering a first taste of their music. “Beyond” was recorded at Moscow Sound studio, while tracking, mixing and mastering are by Sergey Lazar (Arkona, Rossomahaar). The EP includes 2 covers actually. The first track is from Beer Bear’s last album, while the second one is a wonderful cover on Iron Maiden’s “Brave New World” with Russian lyrics. The excellent cover artwork is by Ivan Buylov.